Kawasaki pilot earns third main event victory in San Diego mudder. 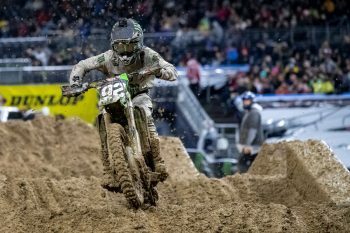 Adam Cianciarulo says he’s at ease after gaining the 250SX West points lead as the Monster Energy AMA Supercross Championship heads east, resulting in a month-long break in the western regional category. The Pro Circuit Monster Energy Kawasaki ace claimed his third main event victory on Saturday night at San Diego’s mud-filled fifth round of the championship, which ultimately granted him the points lead. 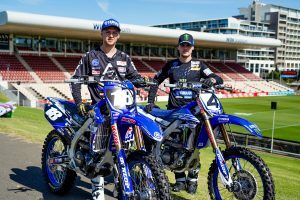 The youthful talent encountered issues at both Anaheim stops, and was only able to capitalise in the points standings at the weekend when former red-plate holder Colt Nichols (Monster Energy Yamalube Star Racing Yamaha) wound up in 10th. “It feels good going into the break and [the points lead] kind of puts the mind at ease,” Cianciarulo explained. “I haven’t had the red-plate basically since I was a little kid, so that feels good. 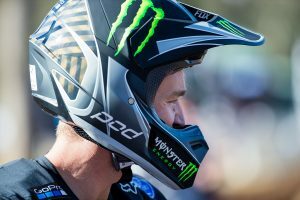 The number 92 has managed to stretch an eight-point lead over Shane McElrath (TLD Red Bull KTM), as the 250SX West class returns for the first East/West Shootout on 2 March at Atlanta. This weekend’s sixth round of the AMA Supercross series will see Australian Hunter Lawrence (Geico Honda) make his debut in the 250SX East category at Minneapolis.